This book presents doctoral supervision as a task involving both academic and spiritual formation. It meets the need for a handbook that deals with supervision from the perspective of the supervisor who is an evangelical Christian and who teaches in an evangelical theological institution, although the principles set out here will also be of help to evangelical supervisors who work in a secular environment. 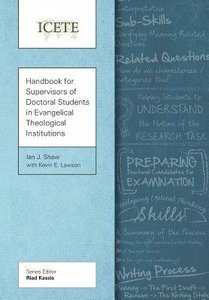 About "Handbook For Supervisors of Doctoral Students in Evangelical Theological Institutions (Icete Series)"